The Dayak Kenyah people live in the lungs of the world. Deep inside the lush rainforests of East Kalimantan, Indonesia, on the island of Borneo, they have coexisted in harmony with their forbidden forests (Tana Olen) for thousands of years. 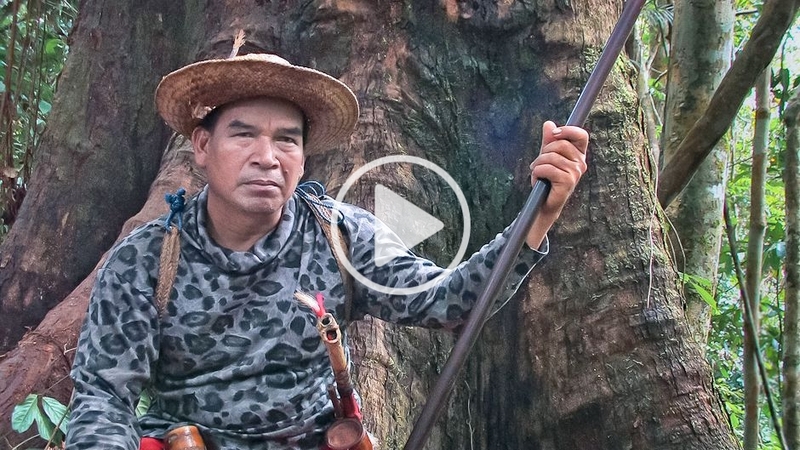 In Setulang village, near the Malay-Indonesian border, lives the “Oma’lung” tribe — a particular sub-group of Dayaks now internationally renowned for gutsy efforts to save their forests from deforestation. Driven by an ancient Dayak code restricting access to the forest and its resources, the Oma’lung use centuries-old indigenous knowledge to manage their natural landscapes sustainably (with practices like shifting cultivation and agro-forestry) so that both humans and nature benefit. Today, the Oma’lung rely on income from farming, particularly organic rice, and from forest products such as game, fibers and poles. Importantly, forestlands are never deliberately destroyed for farming. For many indigenous communities around the world, there are powerful economic incentives to sacrifice trees for timber and large-scale agricultural crops to feed the world’s insatiable appetite for economic development. However, as the 21st century intrudes on their territory, the Oma’lung are adopting an unlikely modern tool to protect their forest: the Reduced Emissions from Deforestation and Degradation (REDD) programme. REDD employs “market incentives” to reduce carbon emissions from deforestation and forest degradation. Essentially, it is a scheme that pays forest owners like the Oma’lung not to chop down their trees. Trees that are saved, and the emissions prevented, are calculated and converted into “REDD credits” — that can be bought and sold on a central market exchange (like the Chicago Climate Exchange) by buyers like big polluting companies wishing to offset their total carbon emissions. Deforestation accounts for a whopping 20% of global annual greenhouse gas emissions. Therefore any chance the world has of keeping CO2 levels below 350 parts per million will rely heavily on our collective ability to halt deforestation. For this reason, REDD is in the spotlight as the potential new star of climate change mitigation strategies. Already big names like Merrill Lynch and Macquarie Bank are seeing REDD as “the new black”, and have put money into projects in Indonesia, Papua New Guinea and Cambodia. At the moment, the UN does not officially endorse any offsets based on avoided deforestation, so trading REDD credits is still in its early stages and only occurs on the voluntary basis. (See the 2009 State of the Voluntary Carbon Markets report). However, in the future, it is estimated that a 10% reduction in deforestation via REDD could generate up to $13.5 billion in carbon credits. By avoiding deforestation, millions of tonnes of carbon dioxide will remain firmly stored in the ground and trees, and the forests saved can continue to regulate the earth’s carbon-oxygen cycle. It seems that for the health of the planet, as with humans, prevention is certainly better than cure. Real benefits or a REDD herring? In Setulang, the Center for International Forestry Research and the Borneo Tropical Rainforest Foundation are working with the Oma’lung and the district government to educate and train locals on REDD. But will REDD actually work? Theoretically, REDD may be a great way to mobilize funds from polluters to forest custodians, so the latter can earn an income without sacrificing traditional livelihoods, cultural practices and ecosystems. Communities will be empowered to resist coercion from logging companies and governments who want to clear traditional lands. REDD projects may also be economically superior in terms of costs, compared to “plant a tree” type initiatives which have exploded in popularity in recent years. REDD schemes are incredibly complex and can only work if it set up properly. Principally that means indigenous rights (land and human) must be recognized, and regulations, measurements, and monitoring must be unassailable. Otherwise neither buyers nor sellers will come to the table. However, critics say REDD won’t actually reduce emissions in industrialized countries, but serves only to give citizens a false sense that emissions are actually being offset, when they are not. One of the peculiarities of the REDD scheme is that communities like the Oma’lung will essentially be paid for doing something that they would have otherwise done for no financial benefit. “They told us a carbon trader would give us a fee if we do not cut the trees… for every tree. That’s what the people told us. Is it true? I’m still wondering,” says Kole Adjang, head of the Setulang Forest Management Agency. This is why many in the world are not ready to accept REDD. The Indigenous People’s Caucus has protested publicly (see this video) against what they see as the unethical commodification of their sacred lands that will permit the “Carbon Cowboys” to continue polluting. REDD is also strongly opposed by Brazil. The recent REDD controversy in Papua New Guinea has also shown how poor governance can turn the scheme into a disaster. With support divided, whether REDD will be included in the new post-Kyoto agreement remains a question. Observers are keen to see how negotiations will play out from now until COP 15 in Copenhagen. History could go against REDD. Earlier cousin schemes, like “paying for environmental services” (PES), had mixed-to-poor results for the same reasons that people are concerned about REDD today: rights, monitoring and governance. In Setulang itself, a PES scheme entitled Community Conservation Concession failed due to a lack of support from donors. Either way, what also remains to be seen is how these schemes could affect internal community dynamics. While policymakers focus on how to structure REDD, there is little debate on the possible implications for the community or the other way around, whether some types of community structures are less suitable for REDD projects. If only parts of the community benefit from REDD and others do not, new tensions can develop. Ideally, land involved would be community-owned and the benefit sharing could serve to strengthen, rather than divide threatened communities. “Only when the last tree has died, the last river has been poisoned and the last fish has been caught, will we realize that we cannot eat money,” says a North American Cree Indian proverb. For the Oma’lung, the death of any tree in Tana Olen is a tragedy. That is why they are enthusiastically looking to modern ways to fund conservation, whether through REDD or eco-tourism. They are quickly trying to learn the 21st century’s perplexing tools and rules, but it should be the other way around. The modern world must re-learn traditional practices from those who have for centuries, and through to today, lived in harmony with nature. Sometimes we focus so much on looking for complex modern solutions, like schemes that try to grow money on trees, that we often forget that the simplest and most effective answers lie in the past. Forbidden Forest of the Dayak People by Alva Lim is licensed under a Creative Commons Attribution-NonCommercial-ShareAlike 3.0 Unported License. Thank you for the update Alva.